Commercial kitchens, like everything else around us, have advanced drastically in the past 20 years. Unfortunately, along with the advancements, fire risks have also increased, which led to the creation of fire protection standards such as UL 300. Yet, only in the past four years has the NFPA officially written UL 300 compliance into their code, and numerous kitchens still resist updating to meet the new requirements. As the vast majority of states have now adopted these standards, it’s time for commercial kitchen owners to get serious. UL 300 originated as a fire safety testing standard performed by Underwriters Laboratories (UL). Appliance companies submit their products to UL for testing. Upon meeting specific fire safety requirements and passing the tests, the products earn the UL label. 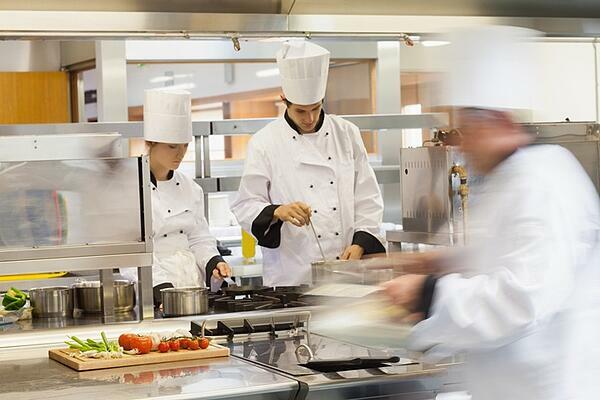 As time passed, UL 300 has grown to also include fire suppression systems for commercial kitchens. UL 300 systems require wet chemical suppression to both smother and cool liquid kitchen fires. Besides just requiring wet chemical suppression, UL 300 systems also indicate new locations for nozzle placement, the inclusion of a manual pull station, automatic shut-offs, and new maintenance schedules for suppression systems, hoods, ducts, and filters. In most states, after NFPA adopts UL 300, newly built kitchens, or kitchens that need to reposition equipment, must use UL 300-listed kitchen equipment and adhere to the updated suppression system requirements. UL 300 was implemented for valid reasons. Over the past twenty years, commercial kitchens have switched to the use of vegetable oils and higher energy-efficient appliances. These changes keep cooking oils and the metals they are in much hotter, resulting in an increase in the potency of commercial kitchen fires. Previous dry-chemical suppression systems are simply not enough to effectively stop these much more powerful fires. Fires originating from vegetable oil and newer appliances require up to six times the amount of suppressing agent to reign in the fire! Which is why new systems had to be adopted. The first, and what should be the most obvious, answer to this question is: SAFETY. Safety for your employees and safety for your patrons. At this point, neglecting to adhere to the UL 300 codes is deliberate endangerment of all people working in and visiting your kitchen. The second reason is to protect your investment. Few restaurants can survive the financial hit that results from a fire that gets out of control. Furthermore, most insurance companies will hit you with high rates if you are not compliant. Finally, as states have now nearly universally embraced the new NFPA standards for UL 300, complying means avoiding fines and potential litigation. If you are unsure of whether your kitchen is fully meeting the new UL 300 standards, call in the fire experts at Koorsen. With over 70 years in the industry, they know exactly what your commercial kitchen needs to be safe and compliant.